Process & Booking » The Indie Design Co.
Once you’ve had a look through this page, go ahead and book your free consultation. This process is designed to help your project move forward in as streamlined and stress-free a way as possible, and ensures we are both clear about goals and timeframes. 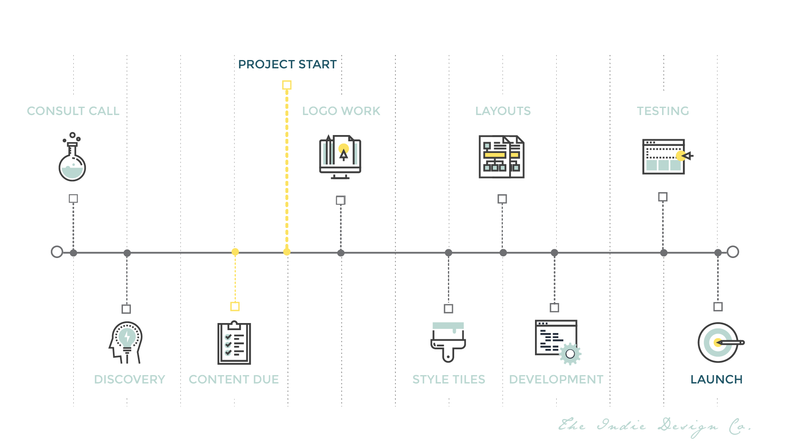 Below is an example workflow showing some milestones… Not every step is included, however, you will have plenty of opportunity for feedback and revisions throughout. Please read this page before scheduling your free consultation! You’ll be able to ask me any questions you have before booking. I’ll add you to my project management system. This is where we’ll communicate and keep all your files and feedback. Don’t worry – I’ll provide you with a tutorial on how to use it! The next step is to create and upload all your website content to my project management system. I request that this is completed at least one week before the web design project starts. 1-2 weeks before your project begins, we’ll hop on a 30-minute call if you’re up for it. This is the perfect time to ask any last-minute questions you may have! I’ll start the design process by creating a mood board that summarises your brand aesthetic and colour palette. I’ll show you three ideas for your main logo. You’ll choose the one you like best, and then I’ll refine it over two revision rounds. Your brand board will include the other brand elements listed in your package (logo variations, sub mark, patterns and fonts etc.) You’ll get to see all the elements on one board. Then you’ll have two revision rounds to make changes. I will then create a mockup of your homepage before I start working on the live site. You’ll have one revision round to request changes. After you’ve approved it, I’ll turn it into your live site and I’ll make your other pages! You’ll then have two rounds of revisions. Before I hand over your final files and website, you’ll need to complete your final payment. I’ll then send you the link to a Dropbox folder containing your finalised brand files and I’ll hand your website over. Don’t worry, I’m not going to leave you to figure out how to use your website all by yourself. We’ll set up a 30-minute consult call where I walk you through how to use and update your website. You’ll also receive access to my client area where you’ll find tutorials and advice to help you edit and update your website. I have listed a few FAQs here, however, you will find more FAQs about Logo & Branding Design here, and Web Design here. I use the WordPress platform. By using WordPress, it will be a dream to navigate and you will be able to easily update your own content from blog posts to shop products. You can be assured of a beautifully designed website built upon robust foundations. DO I NEED TO BUY A DOMAIN NAME AND / OR HOSTING BEFORE I START WORKING WITH YOU? You will need to purchase a domain name prior to work commencing. I offer a hosting package which includes free email and an SSL certificate. You can add this on to your invoice and leave all the tech stuff to me (if you opt to get hosting through me you do not need to add on the upsells like email/hosting/privacy/website builder when you buy your domain!) If you choose to purchase your hosting elsewhere (or already have hosting you want to use) that’s fine too, I will need access to this though! HOW SOON CAN I START WORKING WITH YOU? I am usually booked up at least a month or two in advance, however, this is not always the case, and I do have rush options available… We can discuss this during our consultation. I try to limit email responding to twice a day (9AM – 10AM, and 4PM – 5PM), this enables me to concentrate on the projects I am working on. I do, however, respond to all emergencies as promptly as I can and all clients receive my support email address for this purpose. For normal emails, my response time is between 24-48 hours (but typically much quicker than that). READY TO BOOK A CONSULTATION & GET STARTED ON YOUR PROJECT? You can book your consultation using the form below! You may be wondering what happens after we chat… If you decide you want to work together, you will need to sign my contract, and then pay a 30% non-refundable deposit to secure your spot on my calendar. After that, I will add you to my project management system and you can start working on your Pinterest board and a design questionnaire so that I can create a website or logo (or both) that you love.